This game's pedigree is flawless - Lemmings was first designed for the ancient Commodore Amiga back in 1991, and went on to fill its mantelpiece with every conceivable videogames-related goings on. 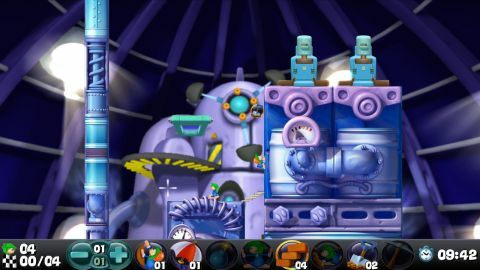 Updated versions were released over the years until recently when Team 17, developers of the almost-equally-classic Worms, took over the series and managed to come up with a superbly reworked PSP version that's one of the handheld's finest puzzling titles. Now it's a shiny, ultra-budget PS3 download. Again, it's Team 17 that's behind this brand new PlayStation Store rendition of the celebrated mind-bending puzzler, which takes classic gameplay and dresses it up in 720p high-definition clothes. The objective of the game will be very familiar to Lemmings veterans. Watch as a procession of green-haired freaky rodents drop down into a harsh, yet cutesy-looking world, and then assign them different jobs to guide them through to the end-point of each level. Climbers, miners, bombers, blockers, floaters, bashers and diggers all have their part to play in videogames' most celebrated rescue mission. However, it's not all roses. First of all there's no multiplayer - at all. This is a bit of a blow considering that the nature of the game makes it perfect for internet face-offs. It's doubly irritating when even the original 16-year-old Amiga title featured split-screen two-player gameplay. Secondly, there are fewer levels - many of the other Lemmings games have had upwards of 120 stages. Here, your couple of bucks will "only" get you 40 levels - a combination of classic levels combined with all-new ones from the twisted minds of the rodent-masters at Team 17. Description When will they ever learn? The lovably suicidal Lemmings return for more maddening puzzles on the PS3's downloadable network.